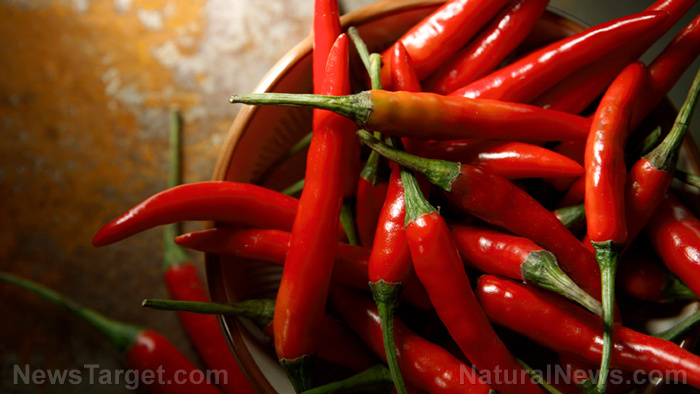 (Natural News) Here’s a good reason to add some spice into your life: Chili peppers were found to be effective in managing symptoms of depression. In a study published in the European Journal of Medicinal Plants, chili pepper extracts were found to exhibit anti-depressive effects. Researchers from Kaduna State University in Nigeria aimed to determine whether methanol fruit extract of chili pepper possesses antidepressant potential. For the study, they conducted three tests in mice: Force Swim Test (FST), Tail Suspension Test (TST), and Open Field Test (OFT). In the FST and TST, the researchers randomly divided 30 mice into five groups: one group received saline, another group received antidepressant drug imipramine, and the three remaining groups were treated with 500 milligrams per kilogram (mg/kg), 1000 mg/kg, and 2000 mg/kg of methanol extract of fruits of chili pepper, respectively. In the OFT, they divided 25 mice into five groups: one group received normal saline, another group receive diazepam, and the other three groups received methanol fruit extract of chili pepper at different doses (500 mg/kg, 100 mg/kg, and 2000 mg/kg). The FST and TST showed that the chili pepper extracts substantially cut the immobility time of the groups of mice that received the extracts, in comparison to the group that received saline. The effect was dose-dependent as the 2000 mg/kg of chili pepper extract caused the highest reduction. On the other hand, results of the OFT suggested that the chili pepper extracts did not cause any stimulating effects. The researchers explained that the antidepressant activity of chili pepper extracts may be due to the presence of anti-inflammatory and antioxidant flavonoids and triterpene in the plant. Based on the findings of the study, the researchers concluded that the decrease in behavioral despair of the subjects indicates that chili pepper may help in managing the symptoms of depression. Although there are available prescription medications that help manage the symptoms of depression, these drugs often have adverse side effects. If you have been struggling with depression and choose not to take any of these drugs, there are many natural antidepressants available, like herbal medicines and other home remedies. Folate – Depression has been linked with low levels of folic acid. Thus, increasing folate levels through food or supplements can help treat depression. Some folate-rich foods include avocados, beans, dark leafy greens, fortified cereals, lentils, and sunflower seeds. Omega-3 fatty acids – Researchers have discovered that people with low levels of two brain chemicals found in fish oil may be at a greater risk of depression. Fish oil supplements contain a healthy type of fat called omega-3 fatty acids. Omega-3 can be found naturally in fatty fish such as salmon, trout, and sardines. Saffron – More than just a spice, saffron can also help treat depression. Research has shown that consuming saffron stigma, the end of the carpel in the flower, improved mild to moderate depression. Zinc – This nutrient is associated with learning and behavior, and low levels of zinc are linked with depression. Taking 25 mg of zinc supplement every day for 12 weeks can help improve depression symptoms, according to Nutrition Neuroscience. Read more news stories and studies on natural treatments for depression by going to Psychiatry.news.